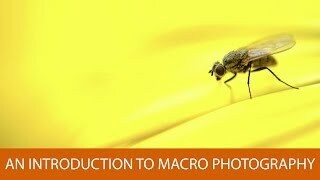 Lecture 01: An introduction to image processing and analysis; covers image processing on a broad scope as well as course logistics. 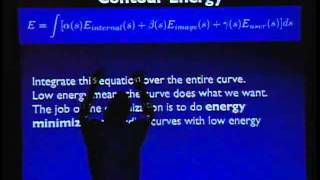 Lecture 02: Introduction to Fourier analysis, as well as the subject of wavelets. 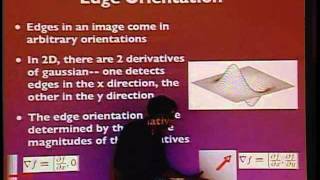 Lecture 03: The lecture covers edge and corner detection using the Canny and Harris corner detector methods. Lecture 04: What it means to have a region of an image be 'salient' and the algorithms for finding such areas. 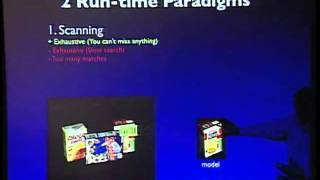 Lecture 05: Carmichael discusses finding certain rectangular objects within an image, and explains various methods for doing so, such as PCA (principal component analysis) and dimensionality reduction. 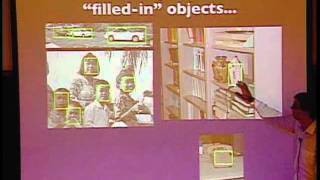 Lecture 06: Carmichael explains how to go about detecting certain objects within an image if those objects cannot be outlined with just rectangles. 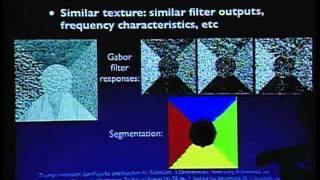 Lecture 07: One method for grouping pixels in an image is presented. 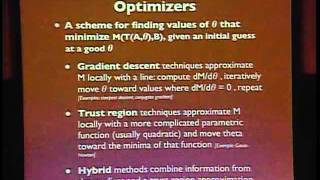 Carmichael discusses pairwise coherence, cluster modeling and modeling with metric spaces. 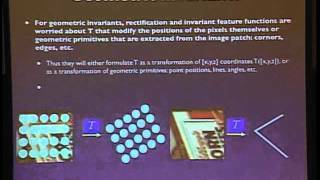 Lecture 08: The second of two methods is presented for grouping pixels in an image. 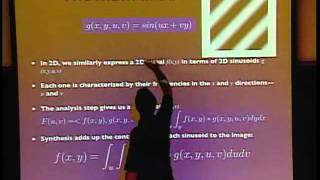 The lecture covers deformable contours, parameterizations and gradient descent. 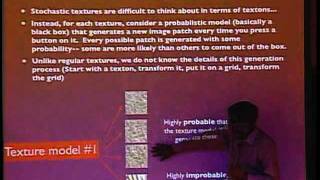 Lecture 09: Carmichael explains why it is useful to study the textures of an image and methods for detecting them in images. 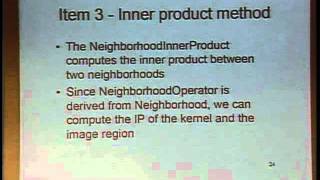 Lecture 10: The instructor explains using neighborhood operations to access different pixels. Also covers implementation of a correlation filter. 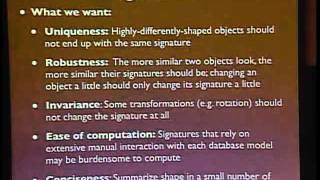 Lecture 11: Carmichale explains the use of invariants for dense and sparse matching, as well as some various kinds of invariants. 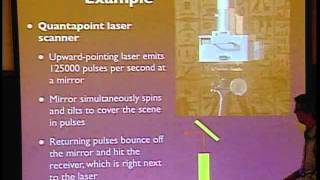 Lecture 12: Carmichael explains how to obtain an image with three dimensions. The unit covers two principles for doing so: time of flight and triangulation. 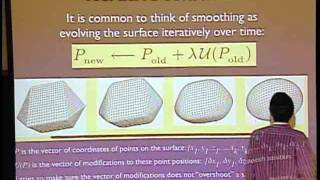 Lecture 13: The instructor discusses using mesh smoothing to remove noise from three-dimensional data. Also includes Gaussian smoothing and mesh shrinkage. 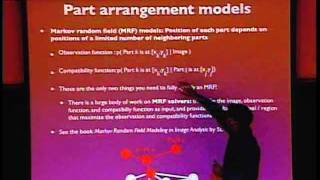 Lecture 14: In the first of two lectures, Carmichale discusses rigid alignment of meshes as well as the metrics and transformation models involved. 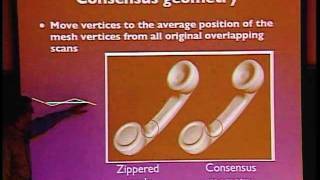 Lecture 15: In the second lecture on mesh alignment, Carmichale explains nonrigid alignment and how to accomplish this process using a technique called deformable registration. 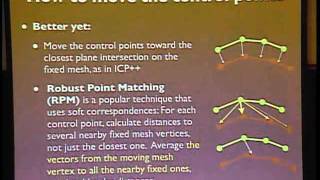 Lecture 16: Carmichael discusses two approaches (mesh-based and volumetric) for combining multiple meshes to form a single closed surface. 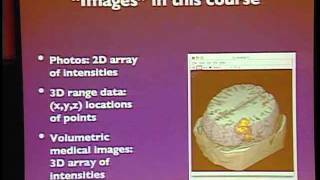 Lecture 17: The instructor discusses ways of storing and searching 3D models. 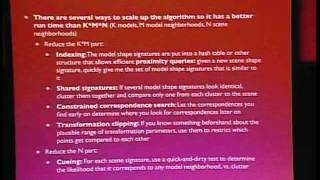 Explains database querying, geons, object signatures and shape histograms. 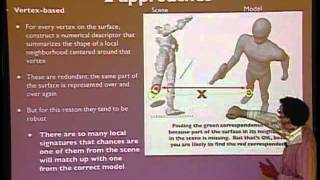 Lecture 18: Carmichael discusses advantages of local shape representations and two methods for creating them: the segmentation method and the vertex-based method. 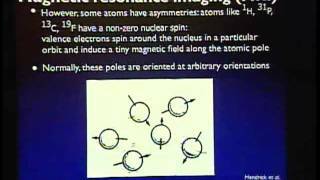 Lecture 19: Carmichael discusses some problems that can arise in range data-based detection and how these problems can be fixed by creating transformation-consistent clusters.